BOARDMAN - The Nyssa Bulldogs defeated the Riverside Pirates 66 to 49 in a game played on Saturday, January 31, 2009. The top rated Bulldogs had dropped a game the night before to the Umatilla Vikings 57-56. They apparently were not going to loose two in a row under any condition. Riverside did have an early lead. The Vikings led 8 to 3 at the five minute mark of the first period. That was the biggest lead they would have because about one minute later Nyssa overtook the Pirates and was leading 10 to 8. 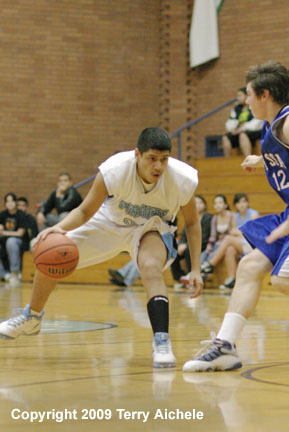 Hot shooters for the Pirates included Jose Barajas, Chase Simpson, and Levi Kaufman. Hot Bulldogs in the first included Jeremiah Leos, Carter Spear, Conner Fiscarelli, and Eric Jensen. Bulldogs led at the end of the first 17-13. Both teams hit more shots in the second period but Nyssa once again out scored the Pirates 23 to 21. Bulldogs scoring included Seth Glenn, Cole Froerer, Jeremiah Leos, Eric Jensen, and Carter Spear. Pirates hitting the shots included Marco Carranza, Chase Simpson, Jose Barajas, and JD Fisher. Nyssa led at halftime 40 to 34. Both teams were a little sluggish in the third period with neither team burning up the place. The Pirates did cool off in the third period scoring only four points compared to Nyssa's 11. Nyssa led 51 to 38 at the end of the third. Nyssa outscored Riverside 15 to 11 in the fourth period. Nyssa continued to dominate play in the first five minutes of the fourth. Seems like things should have been good for the Bulldogs being up 59 to 43 but for some reason one of the coaches for Nyssa was given a technical which sent Levi Kaufman of Riverside to the foul line to shoot four foul shots. Kaufman made three of four closing the gap to 13, 59 to 46. Riverside battled through the last two and a half minutes like they were down only two points. The Pirates showed a passion to play even when they were down by 17. Nyssa won 66 to 49. 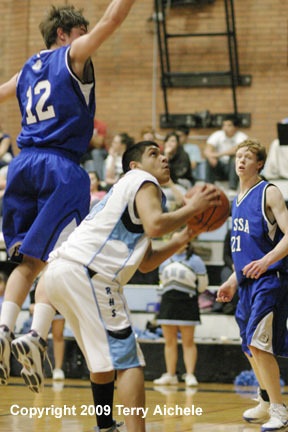 LEFT - Jose Barajas of Riverside eyes the basket while surrounded by Nyssa defenders. 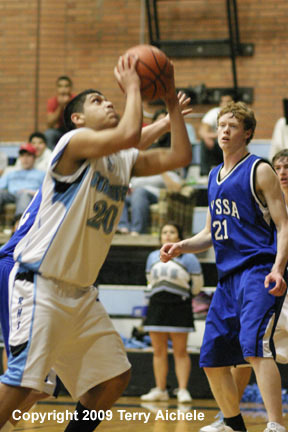 RIGHT - Pirate Jose Barajas gets ready to drive past Seth Glenn, a Nyssa defender. 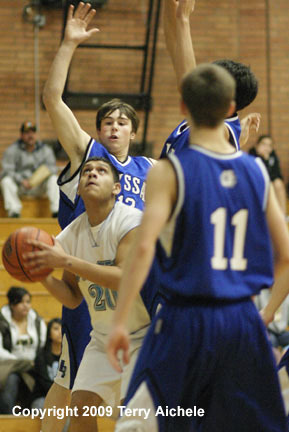 LEFT - Cain Murillo of Riverside protects the ball from Daniel Thornley of Nyssa. 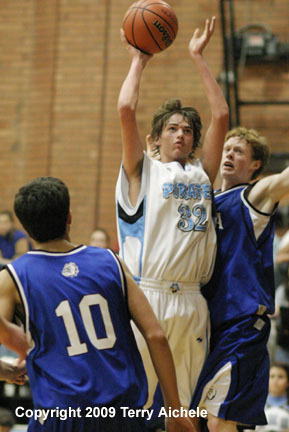 RIGHT - Riverside's Chase Simpson shoots a jumpshot.